Napping: Reasons for taking daily afternoons and the science to support it. Napping – what a riveting subject to be writing about today, eh? I’m hoping to make it seem a lot more exciting than it may seem on the surface. For example; what did Winston Churchill, Salvador Dali, Albert Einstein, Leonardo Da Vinci, John F. Kennedy, Thomas Edison and Aristotle all have in common? That’s right, napping – they all famously wrote about and charted the importance of taking a restorative nap in the day. They have it right in Spain, whereby many towns close down for a couple of hours in the middle of the day when the temperatures are at their highest… I always felt good when I spent much time in the South of Spain in my younger years and making the most of having a siesta. Many of my favourite athletes and sports people take naps in the afternoons as part of their training regimen, Paula Radcliffe (world record holder for the marathon) and numerous boxers in particular claim that napping is as important as the exercise regime and aids the physical recovery of the daily exertions. I know many others that state the same. 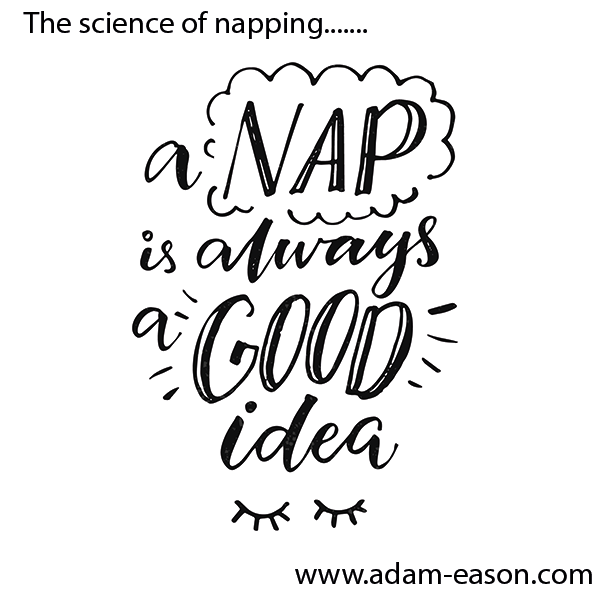 Not that any of us are necessarily looking for an excuse, but napping has been proven to dramatically increase and improve learning, memory, awareness levels and more. Unfortunately, due to our corporate, modern day, fast-paced lifestyles, a mid-day nap has been overlooked, seen as a luxury, sometimes frowned upon and in some cases even considered a sign of pure laziness. People have become so consumed with their 9 to 5 that they see napping as unproductive, without realising that napping is actually very good and a completely natural phenomenon in the circadian (sleep-wake cycle) rhythm and makes a lot of sense when you examine the evidence to support it. According to a recent research in US business, drowsiness on the job actually costs $18 billion a year in lost productivity. Clearly, sleep deprivation is a very real problem for many dedicated professionals. Napping may be your secret weapon for a boost in productivity: Many workplace cultures are harboring an always-on, overwork mentality. When you’re not at work, you’re working from home, thinking about work, or checking your email. But what happens when your passion for your job begins outweighing sleep? Your productivity takes a nosedive. In his book The Gathering Storm, Winston Churchill put to rest the notion that you get more work done if you don’t sleep. In a poll by the National Sleep Foundation, one third of Britons now sleep for just five-to-six hours per night, which is significantly less than the standard seven-eight hours that conventional wisdom tells us that most of us need. Fortunately, a short nap can be highly efficient to temporarily compensate for a lack of sleep. In a 2010 napping study by Lovato and Lack, a 20 to 30-minute nap consistently improved performance on cognitive tests in the hours after snoozing. It’s a quick fix for upping your information intake: Whether you’re attempting to prepare for a presentation or just doing a bit of research, fatigue can get in the way of not only your memory, but your understanding. Sleep helps transport new information from your brain’s hippocampus to a permanent storage area known as the neocortex. Without enough sleep, you’re left feeling forgetful and out of it. Research carried out at UC Berkley by Walker et al (2010) also shows that an hour nap will dramatically increase ones learning ability and memory3. A study from the University of Colorado Boulder also found that children who missed their afternoon nap showed less joy, less interest, more anxiety, and poorer problem-solving skills than other children. Same goes for adults; a nap of provides a sort of reboot, and gives our brain a refresher, which helps us function better and feel ready to tackle the day. You’ll spark more creativity: If you’re looking to give your brain a jolt, then napping may be just what you need. “For often, when one is asleep, there is something in consciousness which declares that what then presents itself is but a dream,” he declared. A study by Medvedev et al (2012) at Georgetown University’s Center for Functional and Molecular Imaging looked at 15 at-rest individuals. It showed the activity on the right side of the brain — the hemisphere most associated with creativity — chattered busily to itself and to the left hemisphere, which remained relatively quiet. Getting some rest may be more crucial than pushing through the times when you’re creatively challenged. You’ll feel more engaged and happy: No matter where you work or what you do, everyone could use a little mood boost. While you may experience some grogginess and impaired alertness immediately after a 30-minute nap — this is called sleep inertia — it will be followed with mental improvements for up to 155 minutes. Finding a quiet place to rest during half of your lunch break may ensure you’re a happier and more engaged team member, especially when it comes to undertaking a challenging task later in the afternoon. It’s downright healthy: For many people, improving your focus and productivity means relying on caffeine and sugar. We all know this isn’t exactly healthy, but sometimes it’s all they can do to stay alert. But naps may be just what the doctor ordered. According to a study by Harvard School of Public Health (Siestas of Health Adults and Coronary Mortality in the General Population by Androniki Naska et al., 2007) a 20-minute power nap three times a week can reduce the rate of heart disease in healthy individuals by 37 percent. WHat’s not to love about those findings! Obviously sleeping at your desk might not people appropriate and may throw some people off. Therefore, if sleeping under the desk isn’t an option, you might have to get creative. A great example of this is at the University of Zurich, there was also a relax/sleeping room where you could tell the receptionist when he or she should wake you up, to continue with your learning process. A lot of people go to work by car, this car sits around for 8 hours before you go back home after 5 or 6. Why not use it for a power nap? It’s quiet, mostly dark and gives you the perfect seat for a cool 20 min. power nap. Many gyms and health club facilities have relax zones where you can unwind and have a power nap. If you have a long commute and a long way to get to home and to work, obviously this won’t work. But if it’s around 20-30 minutes, it might as well work for you to quickly nap at home, after eating lunch. Eccentric Catalan artist Salvador Dali believed that one of the pivotal points to his becoming a great painter was what he called “slumber with a key.” This term refers to an afternoon nap designed to last no longer than a second. In his 1948 book Salvador Dali: 50 Secrets of Magic Craftsmanship, he wrote his five steps of how to take the ultimate nap. a) Sleep sitting upright in an armchair. b) Hold a heavy metal key in your hand. c) Place a metal plate upside down underneath the hand holding the key. d) Allow yourself to drift to sleep. Once this happens, you will drop the keys, which will hit the plate and make a huge CLANG! e) Wake up and congratulate yourself on achieving a micro-nap. Einstein practiced this same micro-napping too and claimed it fueled his brain greatly. He wrote about his napping, whereby he never allowed himself to drift into stage two of sleep. To ensure this he would sit in his favourite armchair holding a teaspoon and ceramic cup and begin to doze off. Again, once the teaspoon dropped, it clanged in the cup and woke him up. Waking up during the first stage of sleep taps into the part of the brain that creates vivid imagery and sensation. You knew I was going to say this, didn’t you? 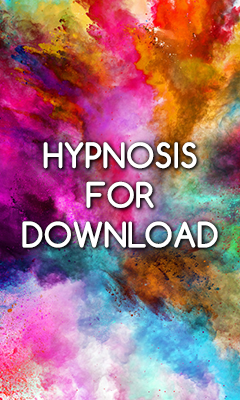 Learn self-hypnosis and use it to help you quiet your mind, lull yourself, advance the restorative qualities of napping and much more besides. If you’d like to learn more about self-hypnosis, understand the evidence based principles of it from a scientific perspective and learn how to apply it to many areas of your life while having fun and in a safe environment and have the opportunity to test everything you learn, then come and join me for my one day seminar which does all that and more, have a read here: The Science of Self-Hypnosis Seminar. Alternatively, go grab a copy of my Science of self-hypnosis book. One of the keys to napping that is well documented, is that you ought to take the nap approximately 8 hours after you woke from your long slumber. Ideally too, it should not be later than 3:30 in the afternoon as it may well subsequently upset your ability to nod off properly that night. Napping, in addition to a good night’s sleep is good for you, both physically and mentally. A nap can be a pleasant luxury, a mini-vacation. Keep in mind that getting enough sleep on regular basis is the best way to stay alert and feel your best. But when fatigue sets in, a quick nap can do wonders for your mental and physical stamina, keeping in mind that too long can leave you waking up wondering where you are and what year it is! Hi Adam, the most contented people I have known have been advocates of “resting their eyes” for half an hour after lunch – though the slight snoring noises they produced indicated it was more than their eyes that were resting! An interesting and fairly easy read for anyone who wants to understand why even a little bit more sleep can be so helpful is a book called “Why We Sleep” by Matthew Walker (Penguin Random House Books, 2017). Thank you very much Amanda, and I’ll be sure to check out your recommendation.